Whether your space needs room for gourmet appliances or plenty of space to entertain friends and family, the placement of all these features is very important. Think about sinks. Yes, a sink in a kitchen should be in an area with countertop. But do you put it in the kitchen island, or against a wall? Beneath a window, or facing your dining room? These decisions are made based on your needs and wants. A sink beneath the window, for example, allows you to keep an eye on children or pets in the backyard, watch the sun rise or set, watch snowfall or rainstorms, or enjoy a refreshing breeze while washing dishes or prepping dinner. A sink facing outward in a kitchen island allows you to socialize during gatherings, watch TV, or help children with homework. A sink nearby the range allows you to prep and cook quickly while one placed in an island or near a coffee station might help you at other times of the day. Each placement decision is personal–and designed just for you. Design isn’t just about where to place things; it’s also about where to not place something. 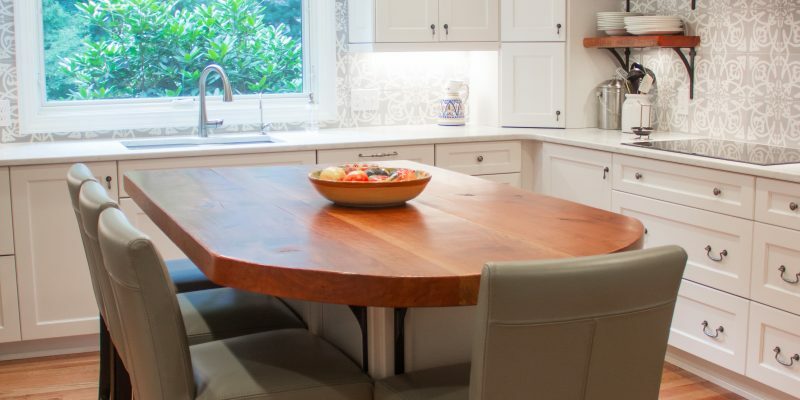 What area of the dining room or kitchen will you leave open for a table? Saving the windowed alcove in the kitchen for a table & chairs means natural lighting for your breakfast nook, as well as a gorgeous view during your morning meals. We can help you make these important design decisions; our designers create based on your wants and needs, and their expertise. Contact us for a consultation if you’re ready to plan your dream space.